May 23, 24, 25 at Maharani Hotel , Kozhikkod, Kerala (No Registration Required, All are welcome, about 1000+ new faces needed). ‘Ennu Ninte Moideen’ is a love story directed by RS Vimal who has earlier directed a short film dealing the same subject bagging couple of awards. 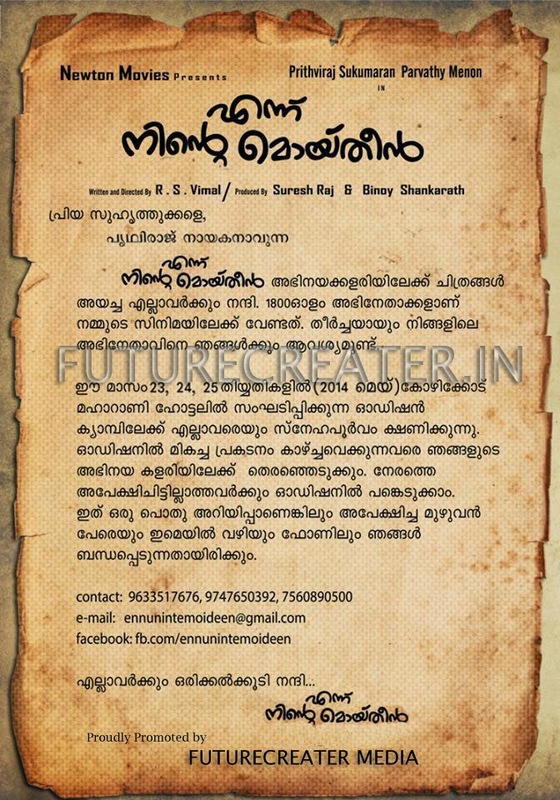 The movie is based on a true story of the love life of Moideen and Kanchana. The incidents took place in Wayanad in the 1960s. The couple, whose fathers were wealthy and influential persons of the village, fell in love at an early age, but weren’t allowed to get married owing to their different religious backgrounds. “Moideen was an extremely interesting character in that there was nothing that he wasn’t. He was a footballer, editor of a sports magazine, a photographer, and above all, a social worker. He died while saving the victims of a country boat accident.” says Director Vimal while talking to TOI. Prithviraj was very much interested when he heard the story. Director says, the reason why he chose Prithviraj to play Moideen was because he needed someone who would stand out in a crowd, and had the stature of a person loved and admired by all. Parvathy Menon, who has made quite an impact with her Tamil movie Mariyan is the now most sought after actress in south cinema. Lal also plays a vital role in the film. RS Vimal will write the script and Rafeeq Ahamed’s will write the lyrics for the music composed by Ramesh Narayan. The film will go on floors by mid next year. U S based producers, Suresh Raj and Binoy Shankarath will be producing this movie under the banner of Newton movies.